The Casino Drill is the brain child of instructor Tom Givens. It is a 21 round drill with a 21 second PAR that involves shooting 6 different targets in numerical order and two reloads. It is a solid drill, hitting several skill areas, and forcing the shooter to think about following specific directions while also shooting. That is really the treasure inside the drill, applying a cognitive load while also requiring a moderately high skill level to meet the 21 second PAR. The one issue with the drill is that it requires a specific target that I have to order in a large enough quantity to shoot the drill as often as I want to, or hope that the range I am shooting at has them. I typically don’t order targets frequently enough to really make that a viable solution. Fortunately, someone else thought the same thing and created a smaller version that is printable, and called it the mini-Casino Drill. All the same rules apply, but the targets are quite a bit smaller, making it a bit more difficult. The drill says it can be shot at 5 to 7 yards, but since the original Casino Drill is shot at 5 yards and these targets are even smaller, I stuck with 5 yards. My first attempt at the drill was pretty abysmal, I made the 21 second PAR, but had several misses. The targets being as small as they are really makes shooting them at speed a challenge at my current skill level. I decided to keep shooting the drill to see if I can get it clean and under PAR after warming up. 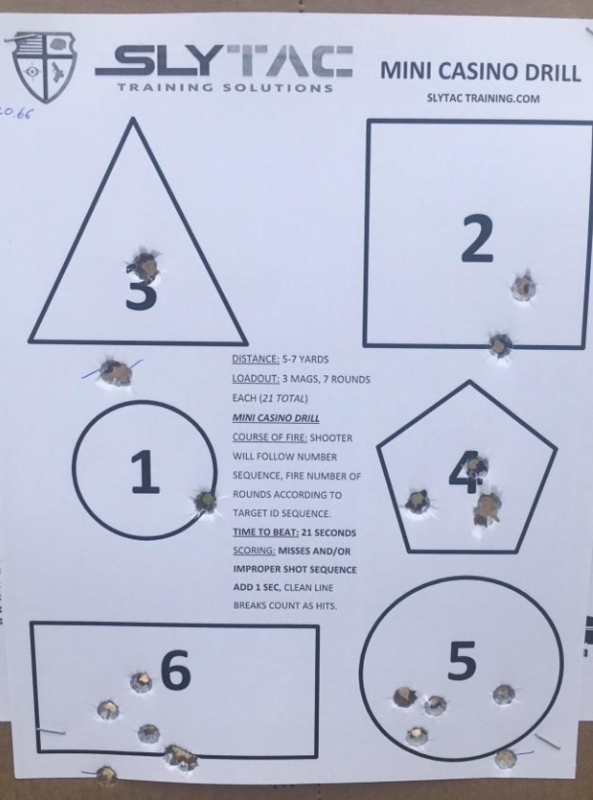 On my second attempt I focused more on the shooting aspect of the drill, but the “cognitive load” part of the drill caught up to me and I lost track of what I was supposed to be shooting and shot targets out of order. Finally, on the third and fourth runs I was able to put it all together. Now that I know I can do it, I can use the drill as a “cold” test to gauge my ability to shoot and think at the same time. Over time, as my shooting improves, hopefully my times will as well. The real value of this exercise is in the learning to think about something other than shooting and still execute the shooting part at a relatively high level. Competence levels can basically be broken down into two levels, being able to do something well while thinking about how to do it, or being able to do something without having to think about it. The goal of course, is to be able to do things well without really thinking about them, so that we can process information and think about other aspects of the problem in front of us. Whether it is a practical pistol match, aliens invading, ninja’s crashing through the ceiling, or something else a little less far-fetched … having the ability to execute skill and think about other things at the same time is critical to success. This is a spectacularly simple yet effective drill for getting to that ultimate goal. Give it a try, and let us know how you did in the comments. *Editor's Note* We feel strongly that drills are one of the best ways to increase your skill level. This is one of the reasons why we carry drill cards, like these, in our store. They are an economical way of helping you up your skills. Make sure you check them out.